We are Ireland’s leading steel garden shed and concrete and Duraboard building designer, supplier & installer. Based at Johnstown Garden Centre, Naas. Our Team are renowned for delivering excellent building standards and customer service. Garden sheds are a great way to increase your storage capacity for when you run out of space in the house and can also be used to protect garden equipment and furniture. Our range of sheds can be used for a variety of purposes to provide you with a space to cater for all of your backyard hobbies and games. When you want something substantial and longer lasting then it’s time for you to consider our concrete building range. 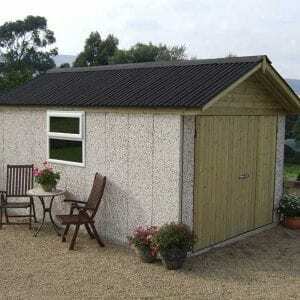 We have a range of concrete buildings that we can offer you, which can be used as a garage or garden equipment. They are perfect for freezers, washing machines or tumble dryers. Duraboard sheds are a hybrid shed constructed with both timber and concrete fibers to create a strong, long lasting structure with a wooden finish. 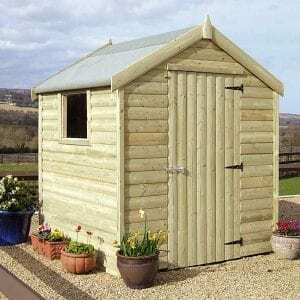 Duraboard sheds are ideal for any of the purposes that you’d use a traditional garden shed or garage for but they have the benefit of using more modern building materials. Our product range is extremely versatile with three different timber finishes throughout the timber garden shed range and a variety of size and roof style options. Our concrete garages are available in 4 different ranges with choices of timber doors, steel door and roller shutter doors. Light is provided by translucent roof sheeting and the option of PVC windows. We can also offer a concrete base laying service for the concrete shed and garage range throughout Leinster. Contact us at 01 524 2441 or at info@theshedcompany.ie for any queries you may have.